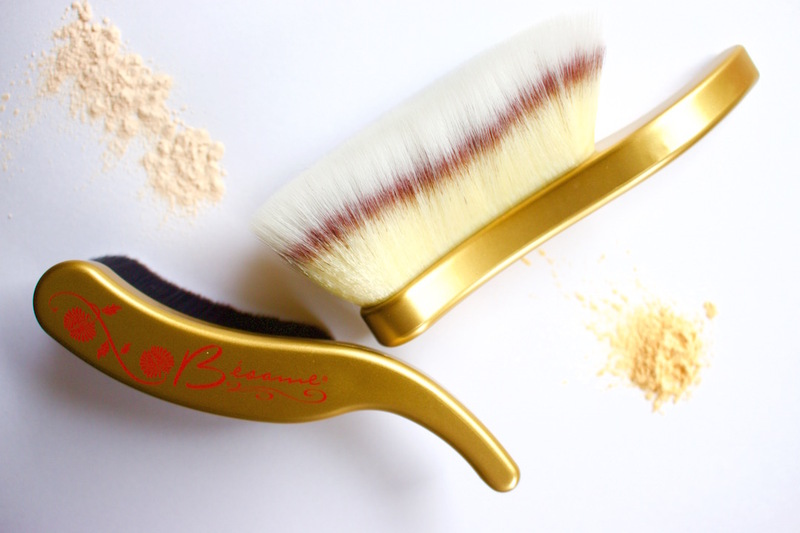 Theres something about boudoir style brushes that just makes them seem more luxe, isn't there? Besame are fairly known for their colored correcting powders (all vegan, just not their lipsticks) available at Sephora but they also offer these two fancy looking brushes! Now these are NOT cheap and i say that often but i really mean it with these! This has to be my favorite of the two, the hairs are SO soft and fine and pick up translucent powders beautifully. They deposit product evenly and don't disturb the makeup underneath. This is definitely one of those brushes you just want to rub on your face for a good hour or so. I don't think powder foundation would be very easy to apply with this just because its so fluffy. I think it'd take a LONG time to build up coverage with this. Surprisingly easy to wash with a solid soap like Dr Bronners, just be sure to gently squeeze out as much excess water as possible! This brush does have a multitide of uses but theres something about the shape that i just can't quite get to grips with. It definitely applies mineral foundation and liquid foundations beautifully but i think i'm just used to a more symmetrical shape. Although it does work for contouring/bronzing, i found the handle got in the way a little and i think i'd prefer it without the tail end of the handle for this purpose. You can also use the tip to apply highlighter to the tops of the cheeks but anything more detailed than that, i think you might find the brush a little bulky for. Overall, beautifully designed and made brushes, just not an everyday essential for me. I also wonder if the shape would feel a little goofy for the left handed people out there so let me know if thats something you've experienced! I think if you were just in love with the shape and look of them, it might be a worthwhile gift idea to throw on your wishlist... otherwise i don't know if you'd utilize them enough to warrant the price tags. If you've tried these brushes, please do share your thoughts below!